The surface of this egg is divided neatly into rectangular sections by thick black lines. A few of them are filled in with red, blue or yellow colors, all perfect and smooth. As of yet it is unmarred by any cracks though it does seem to give a little shake now and then. Calm, quiet, tempered, Naroth has a firm foundation, and is not easily shaken. Yet unlike stone, he is not hard; in fact, he is quite malleable, creating a subtle enigma of a creature. A thirst for knowledge and deep-seated wisdom permeate his being in nigh-unfathomable ways. He’s a philosopher and a scientist, with a tendency to ask questions of the tangible and intangible world alike. Knowledge, he shares willingly, as well as ideas and hypotheses, but he does not seek your thanks or praise in any aspect of his life, though he proves a willing and worthwhile companion around every turn, even occasionally evincing a droll sort of humor that might make you do a double-take. He is more than capable of taking care of himself in every way, and equally able to lift you up when you’ve fallen, but he is comfortable with distance and a knowledge that friends and companions are there at all, however distant. With a bond in his mind, he is content. But distance does not equate with disinterest: indeed, Naroth proves a powerful mediator, an objective and reasoning party who staunchly defends what is his with a mind open to the other possibilities out there, and as a result, he makes a point to ask questions that occasionally test limits and cause people to look inward; and yet, he’s neither forceful nor judgmental, rather preferring to test the waters with a lighter touch and awaken self-awareness where it is needed. Likewise, he is an open mind and a welcoming rock to those who need him. Physically too will he defend what he views as his, and he is unflinching in this regard. Don’t ever expect a show; quite likely, he will appear to take a few blows and, if that’s not enough, deal one or two of his own. And one or two is all he will ever need, for while his thoughts and world-view are free and malleable, his movements are calculated and exact and, though smaller than his fellow Lords, he is built for power. His wings are almost overlarge (something he has had to accustom himself to while growing, but which makes him a powerful flier now that he’s grown), while the rest of him is compact and muscular. His opponents may make the mistake of thinking him slow; in the moment it takes to realize they were wrong, he will have already won. Likewise, he seems to have an innate ability to exert only what force is necessary, never over-much or too little—but then, he is not perfect. While acts of over-aggression are not common, they may occur; considering that the other party will always have brought it upon themselves, however, he is unlikely to apologize for such acts. If he is unassuming in nature, at most times, his hide too displays his calm, detached quietude. 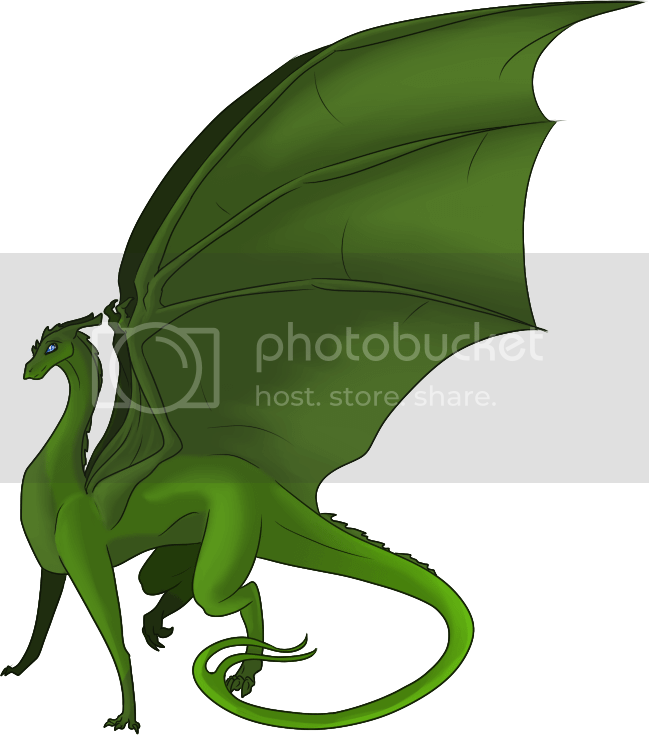 Deep, chocolaty brown pours across his spine and eases smoothly into the jet black of his feet and head as it fades down the outsides of his legs, his wings, and the uppermost part of his tail. There are no other markings—only the silky shine of transitioning colour down and across his muscular and precise body. A body so precise, in fact, that even his front legs are a little longer than most dragons’, lending him a slightly more graceful stride than most, and generally making movement on the ground just that much easier. It is difficult to say exactly what the basic tone of this Emerald’s hide is as it is distinctly mottled, light and dark hues swirling and blending together all over to make what, at a distance, appears to be a solid medium-green dragon. Every shade, however, is exceptionally rich and jewel-bright, eye-catching and delightful hues appearing everywhere on her body. Darker tones are more prominent on her headknobs and wings, as well as her feet, while her tail seems just a bit lighter. Unusually tiny for an Emerald, she is very dainty and beautiful, with an easy elegance to her movements and universally recognisable slim beauty to her form. There is no doubt she is a very lovely dragon, despite her small size, even though she does not even try and has little regard for what she looks like. A quiet and retiring creature, she tends to accept whatever is asked of her without complaint, obedient to a fault, and never asking anything for herself. She will never readily admit to having any wants or needs of her own, and will only open up to the person that she is closest to if she feels accepted and loved. The things she likes are few, but her affection is great: she loves the jungle and the myriad plants and animals in it, she loves her close circle of friends and will be in near-constant contact with them, and she loves helping others and will be quietly melancholy if anyone around her is suffering. Yet even though she spends plenty of time looking after others, she will always need someone to do the same for her, and make sure she does not harm herself or the things she loves in the service of another. She is easily charmed and coerced into doing the will of another and cannot always detect deception when it seems like someone is in need. People who come to her with love, however, will be rewarded with a sweet and caring friend with a calm and occasionally insightful perspective on the world. She is very good with animals and happy to look after younger creatures, with a soft soprano of delicate flutes and violins seemingly made for singing lullabies. A somewhat fragile creature, exposure to the harsher aspects of life may cause her to retreat far inside herself, but among caring and thoughtful people she will be the wonderful sweetheart and true friend she is meant to be. Here is a tiny dragon; whose delicately-crafted head barely reaches the chin of any humanoid of somewhere around six feet tall. It — she, there is something very feminine about this sexless dragon — is delicately-boned but surprisingly strong, muscles lean over her vibrantly-colored hide. She certainly makes a statement, all flouncy wings and something that has to be the sheer joy of life in her prancing stride. Long wings lend endurance to this one, while its slender build might otherwise seem to hamper her. Try and stop her, though! Less pale than are many of her Opal siblings, the film of white over this dragon is thinner than you might expect. In sunlight she still gleams as a marble statue, white and shining, struck through only faintly with streaks of bright colors. Indoors, however, chartreuse and caribbean blue twine jauntily down her spine and down the dish of her face; clouds of bubblegum pink and hazy lavendar take over the bulk of her belly and neck. Lemon and lime speckle haphazardly over the endless blue sky of her wingsails, carrying down over all of the rest of the colors in a delicate ticking. Lazy strokes of misty white do obscure her even indoors in brighter lighting, but she's more or less a vibrant-looking little dragon, full of life all but exploding from her seams. For a dragon whose very presence is loud, Iliyth's mind is surprisingly subtle. Hazy colors twirl in a pleasant dreamscape, excited emerald and playful magenta and affectionate citrine all wrapped up in the warmth that is Iliyth. She is warmth, a guiding light through stormy weather and an express train right out of tedium. She is a bulwark of silence on rare days spent curled in front of the fire, she is a sense of safety and comfort when you're out of your comfort zone, she's the little imp on your shoulder when you need a push it. She is the scent of strong tea and old books, fresh air and sunshine, the ozone that lingers around the strike of lightning you just barely escaped, and she is home. Even when you're nowhere near it. Don't discount even a young Iliyth with hasty labels of 'precocious' or 'capricious'; maybe she spends a great deal of her time excitedly relaying to you the adventures she's had in the basement with the dust bunnies, or playing a rousing game of catch-the-tail when she just can't sit still, but that's not all there is to this Opal. She'll need some time to develop her tact and subtlety, need some practice to not just come right out and say T'Rae you're being stubborn let's just go! when what she really means is I know you're feeling comfortable where you are but there's a Nomad Festival happening in the village and we should go fire-dance because you love studying other cultures right? Right?, but she's young. She'll also tend to accidentally eat too much and have accidents on your rugs until she can go Between; it's just part of growing up. Iliyth is a very focused dragon, for all of her shenanigans. Few of her siblings will understand just why she spends so much time carefully drawing you out of your shell, or weaving a sense of security around you where you are, or just flopping behind you while you read one of those trashy paperbacks you totally don't own any of. After all, a dragon does have a life of its own! This Opal doesn't have much time for that sort of thing, though; you are the order to her chaos, you shore her up when she might crumble, and what do others have to offer that you don't? Not a whole lot. Sure, she'll socialize — she'll cajole and wheedle and plead with you until you join her, dress up for the big gala, and she'll stay right by your side as a steady comfort while she introduces you to half of the village that she somehow manages to know intimately although she doesn't spend a great deal of time in the village. Dragons are telepathic! She's plenty capable of talking to the others while you're both curled up by the fire. There won't be a whole lot of that, though, T'Rae. Iliyth knows you, and oh does she love you for exactly who you are, but she also sees what you could be. She sees friendships blossoming, sees the world falling at your feet, sees adventures conquered and the glory of your beloved science unfolding before your eyes! Can't you see it? Can't you see how the storm you're chasing brings life, how the aurora change and shift oddly beneath planet's fluctuating magnetic fields? Wouldn't you like to see the sunrise turn vividly blue in the gas fields off of giraffe island? Of course you would! You're amazing, you've got the strength to do anything you want, anything at all, and this Opal is going to see that you get there. She'll charge into battle with you astride her if you want her to, she'll fly through hell because you can, and she firmly believes that you're the bravest and best person she'll ever know. You're hers, so obviously you are, right? What better way to see your full potential than to go out and get it? Iliyth won't miss the whole flight routine. Certainly, there's a sweet femininity to her large eyes and swaying gait, but it's got nothing to do with her reproductive cycle. She doesn't have one. She doesn't have any desire for children. If you should ever have any children of your own, she'll love them with all of the devotion she has for you; and she'll even dote on your shinies or your closer friends, but Iliyth doesn't have any sort of a maternal instinct. She's more likely to try and talk young dragons or children into a grand adventure. This Opal works on the firm and relentless belief that the pair of you are going to chase greatness across the planet and back. She might not have the strength to carry you for forever, but you don't need her, and anyways your strength is her strength. She'll carry you until her wings give out, she'll have your back, and yes — she'll call you out on anything she thinks is nonsense. Iliyth loves you dearly, and respects you more than you may know, but she also wants you to be the best that you absolutely must be. To be anything else would be…inconceivable, really. Together, you can do anything, and so you will, right? Even if that means her cheerily pointing out the errors in your illicit novels while you recharge your batteries after a long weekend of adventure and social outings, or rooting through the market until she finds an old vid player and a collection of nature documentaries in a language neither of you understands. I drew heavily on your song; "Inspiration" that you sent me most recently, because that's when this dragon really clicked in my head. Her name doesn't mean anything in particular, except that it begins with an I and has two syllables. ;D I pronounce it ih-LEE-th.